Of all the great items to buy for your kids, bunks beds are perhaps the most interesting. They not only save room in your kids’ room, but they are also lots of fun. From arguing about who sleeps on the top bed to climbing up and down the stairs, bunk beds give your kids the best childhood memories. We have researched and investigated the 10 Best Bunk Beds for Kids in 2018. 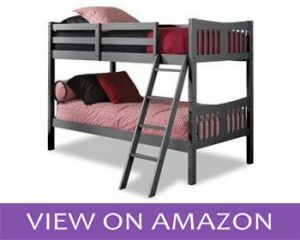 From twin bunk beds to cheap bunk beds, there is someone for everyone. Let’s dive in and see what these models are all about. We start off with a well-made bunk bed that will not cost you an arm and a leg. This model boasts lots of functionality for a small room. 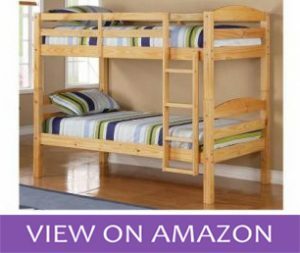 It is our top recommended in our twin bunk beds category. This bed’s size will give your kids more than enough sleeping space. This way, they will retain their personal sleeping space and still have their brother/ sister in the same room with them. With a bunk this size, it will become much easier to decorate your kids’ room and still have enough space for them to play. You can sneak in as many toys as you would like, creating a fun-filled room when your babies are growing up. When it comes to safety, the bed comes with rails, plus the ladder employs a slanted design for safe climbing. Go on and invest in this design and create the growing up moments for your kids. When kids grow older, chances are they will want to move into separate bedrooms. Why not give them that convenience with Storkcraft Caribou? It has a design that allows separating the twin beds. This means you won’t have to go buying other beds in the future. This is a cool bunk bed since it has a construction from rubberwood. It is more stylish, seeing that the finish is modern and you can choose from three different colors. 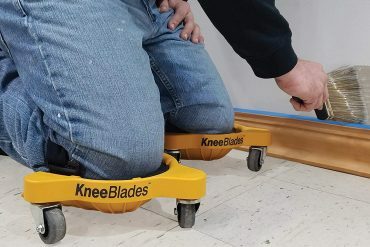 It has a sturdy frame that can accommodate lots of weight while it remains lightweight for simplified moving around the room. This bed will keep your kids comfortable and safe. It comes with a slanted ladder and a full-length guard. You are also guaranteed safety since it meets ASTM and CPSC safety standards. What else would you want in your kids’ beds? Are you looking to get valuable floor space without moving into a bigger house? 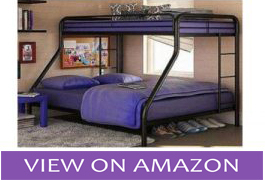 Get the Dorec Living Bunk Bed and give your kids the joy of sleeping in their own beds. 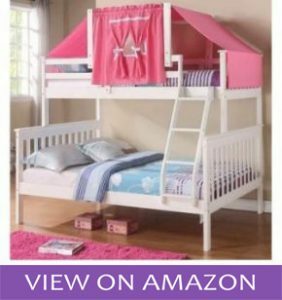 It has everything you want in a kids bed from mattress support slats to guard rails and a slanted ladder in one location. With this model, you don’t need to go looking for box springs or headboards. You get to save money as you make room for playing, dressers, desks, and even an area they can lay out mattresses when friends come for pajama parties. With five sparkly finishes, it brings a mix of style and adventure in a boys’ room. 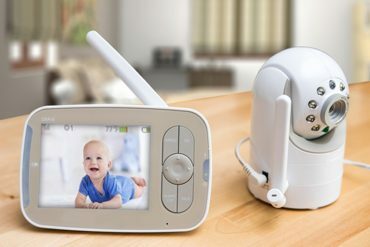 It gives your kids a safe place where they can play and enjoy their childhood. Now you get to invest in a bunk bed that values quality and design. The WE Furniture Bunk Bed is designed to appeal to all kids. 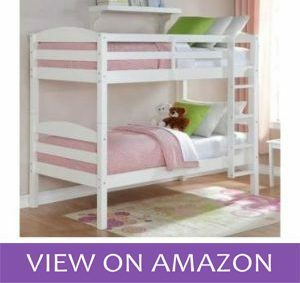 It is a kids twin bed built from solid wood with a natural finish. Since twins love similar items, the striking similarity between the top and bottom bed guarantees you that your twins will truly love their beds. We love that you can choose other finishes so you can appeal to your kids’ preferences. 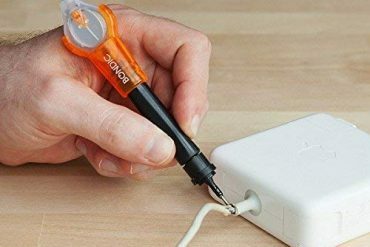 It is perhaps the most straightforward model to assemble with all the hardware and tools available in the package. Not to mention, it is not a very heavy bed so it will not give you problems when dragging it to a separate room. 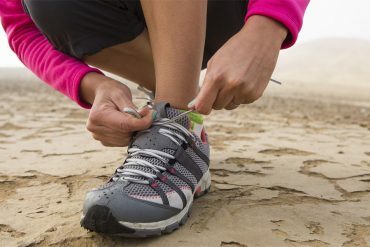 Apart from elegance, you will be getting more functionality. It does not require use with a box spring, and it can accommodate a whopping 250 pounds on each of the beds. And when your kids are older, just unstack the beds to get two twin sizes for use in different rooms. The DPH Metal Bunk Bed is one very elegant addition to any kids’ room. It has a metallic construction and a twin over full design. If you have a teen and a younger kid, you will be able to satisfy their space needs and weight limits with no hassle. Two vertical ladders are positioned on both ends of this bed. They provide a safe way for your kid to get to the top bed. 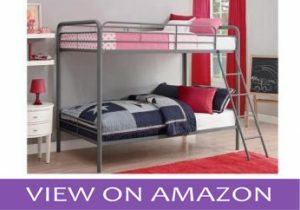 If you are keen on detail and want a bunk bed that is more stylish, you will love the curved metal frame. It adds some oomph to the bed so that it doesn’t appear so plain. This is a sleek and stylish bunk bed for older kids. It gives you efficiency and functionality for a small bedroom. 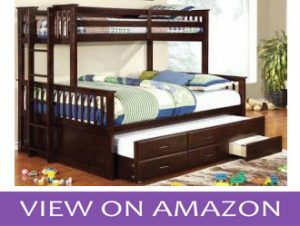 It is a great choice when you are looking for bunk beds with stairs. If you are after more functionality, Furniture of America Pammy Bunk Bed is your go-to model. It is a twin over queen bed with lots of storage space under the bottom bed. It is a unique, eye-popping design that will also appeal to older kids. You only need a few additions to the kids’ bedroom since the trundle bottom has already catered for storing the kids’ bedding. We do love the side ladder access as it is vertical and connected to superior guardrails for ample safety. Now you can have all your kids happy by giving personal sleeping space and lots of room to play and have some childhood fun. Mainstays Bunk bed is a lightweight yet very sturdy bed. It has a white finish that would go well with any décor. Both beds will accommodate a twin spring mattress with no problem. You are provided with the slats, a vertical-step ladder, and a full-length guardrail. It is an outstanding design that will not intimidate little kids. With the bottom bed very close to the ground, it allows for safe getting in and out of bed. It also leaves you lots of floor space thanks to the slim design. We particularly like that it uses solid wood with steel joints. This ensures the bed will never wobble if it is subjected to more weight as your kids grow up. It creates a beautiful indoor environment for your kids. Now you get to decorate as much as you want. When your kid is a toddler, and you are concerned with the height of regular bunk beds, DONCO KIDS gives you a good solution. This loft bed is only 44 inches high. 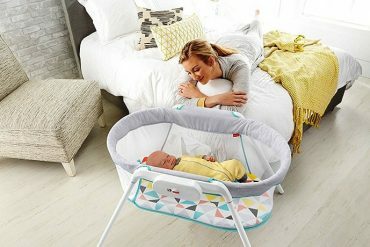 Your kid will never feel unsafe when sleeping on top. It comes with a large play area under the bed with a camo tent to keep it neat if you use the space for storage. Some parents are even able to fit a small twin bed on the bottom making it easy to use with two kids. It remains an attractive solution since you can also choose to go with the blue or red finish to suits your kid’s likes. Do you worry your twins could roll over to the floor when sleeping on the top bed? 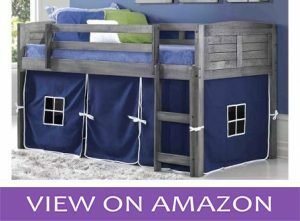 At only 50 inches high, you can now sleep peacefully knowing your kids are sleeping safely on the Max & Lily Low Loft. It even makes the best solution for low ceiling rooms. This bed is super fun with two curtains that create a play bed area in a fort design. The bottom bed is only 2 inches from the ground making it a good option for younger toddlers. You will enjoy superior quality from the New Zealand wood construction. 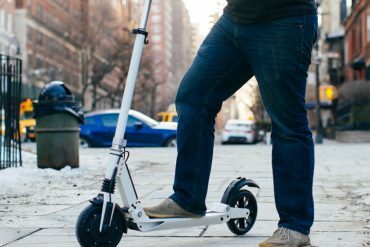 It is very robust featuring a 400-pound weight capacity. It is just what you have been looking for a tiny kid’s room. Are you hunting for the ideal bunk bed for your children? The Donco Kids Twin over Full model presents an attractive design. 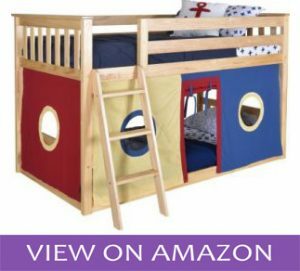 It is perfect for kids who are a few years apart since the older kid can take the full size while your younger kid has some fun on the top bunk. This product has been constructed with your kids’ safety in mind. It meets and even exceeds the safety standards set forth by ASTM and CPSC. These are organizations that ensure you only invest in the safest products for kids. Back to our kids bunk bed, you will love that it is built to last, thanks to the solid pine wood construction. 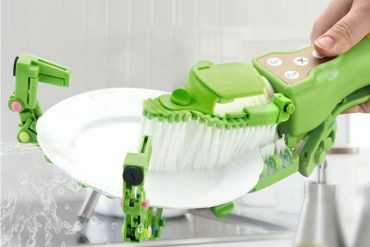 It uses steel joints that ensure it will never develop a weak point no matter how heavy your kids get as they grow up. With the complete slat support, all you need is the best mattress for kids, and your children are set for a long restful night. 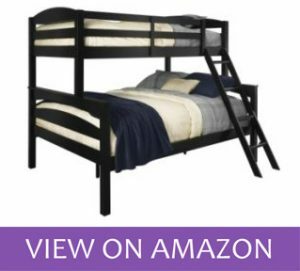 ⇒ You have everything to gain by investing the most popular bunk beds for kids. Bunk beds, in particular, give you extra decorating space and are super fun play areas. Bunk beds are the best solution for small space living. 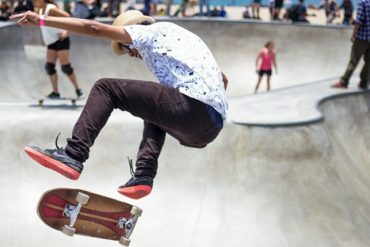 Age of Kids: How old are your kids? It is essential that young kids under the age of six not sleep on the top bed. This is because climbing down can be a challenge for younger kids as using the small ladder is a learned skill. As such, you should consider buying a bunk bed with a low profile for toddlers. Safety Measures: This is perhaps the most important consideration. 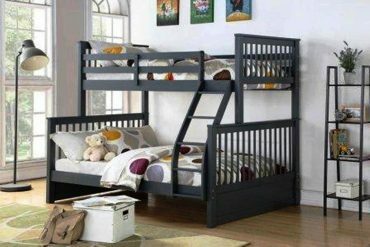 You will want to choose bunk beds with stairs and sturdy full-length guard rails that provide ample protection for your kids as they sleep. This is more so for the top bed. Also, look for full-length headboards and foot-boards. 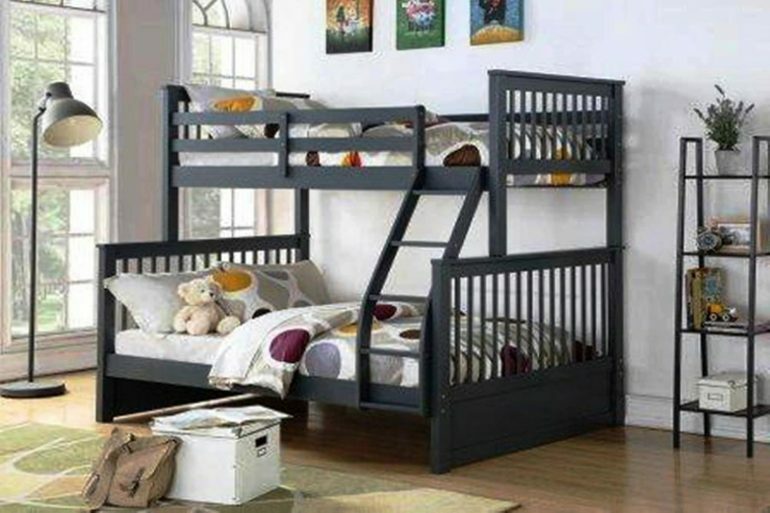 Materials: The best bunk bed for your kids will have a construction from safe and sturdy materials. You will know this by the type of wood and even the weight capacity. For small kids, wood is a better option as it will rarely become slippery when climbing the ladder. Room Layout: Most bunk beds have parallel designs, but you may find others that are in an L-shape configuration. This means you may need more space than parallel designs. You should also consider your room’s ceiling height so that you don’t bring home a bed that leaves very little room between the bed and the ceiling. There you have it; these are the best bunk beds for kids. With these models, you are guaranteed safety for your kids, functionality, and save space in the process. These are beautifully crafted bunks beds that will keep your kids safe and happy.